Fraser Suites Muscat, Oman, celebrated its official opening recently at a special event at the property's ballroom. The event was held in line with their commitment to offer high-quality luxury experiences which are designed to embrace the needs of the modern traveller and saw media attendees given an exclusive tour of each of the unique facilities at Fraser Suites Muscat, said a statement. The facility hosts 120 luxury serviced apartments and complete rooftop pool and spa amenities. The apartments comprise studios and various bedroom configurations, together with all-around city views. 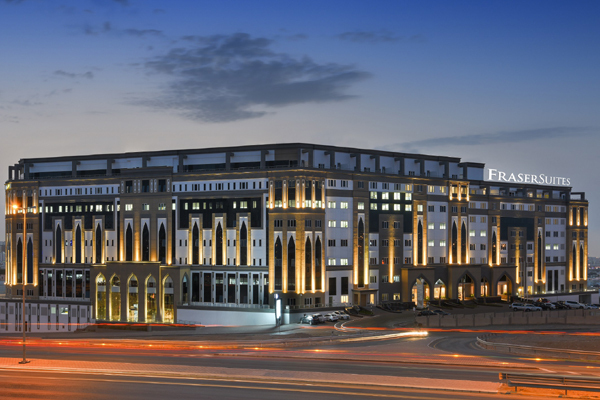 Boasting modern décor throughout the facility alongside a touch of Omani hospitality, Fraser Suites Muscat has several features that make this a one of kind property in the sultanate. Apart from hosting a rooftop swimming pool with a poolside juice counter and boutique-shopping arcade, Fraser Suites Muscat also accommodates a 24/7 fitness room with the latest gym facilities, a lavish spa with four treatment rooms, and large indoor and outdoor children play areas, said the statement. The Fraser Suites Muscat Ballroom has a capacity for more than 800 people and is perfect for planning a wedding, the launch of a special product, a general business meeting, or any major occasion. The 1,500 sq m of space can be used as the main hall or partitioned into four separate conference rooms as required. Fraser Suites also offers all-day dining restaurant, ‘The Oak’, with options encompassing a fusion of Middle Eastern and International cuisine from Chef Hatibu Alfani, including a choice for a buffet or a la carte menu. Designed with a contemporary touch and having floor to ceiling windows and a balcony overlooking the city, the restaurant ensures that all guests are treated to an unmatched dining experience. Additionally, for guests who prefer to dine in the comfort of their own hotel apartment, Room Service is available 24 hours a day. Vincent Le Gorrec, general manager of Fraser Suites Muscat, said: “We are keen to reach out to countries in the Middle East, which have the potential for several cultural tourism prospects, including Saudi Arabia, Oman and UAE. With Oman’s diversification efforts, there has been growth and expansion in various sectors, such as tourism, manufacturing, transport, and logistics, resulting in an increase of demand for high-quality accommodation for travellers. Coupled with a unique range of facilities and amenities and situated close to several lifestyle options, Fraser Suites Muscat is an ideal choice for corporate travellers, vacationers, and even families, looking for a convenient location in the Sultanate.